When I first started this blog four years ago, there were few photo book companies offering lay flat photo books for the average consumer. Most of the lay flat beauties out there were marketed only to pros and for the obsessive DIY bride like me, that left just a few options. That’s how this blog began – the more I researched options for making my own wedding album, the more my head was swimming with all the information I was finding. I thought there had to be other brides and grooms out there trying to navigate through the photo book mire and I decided to start this site. About 10 wedding albums and tons of birthday, travel and baby photo books later…as they say, the rest is history. With the fourth anniversary of this blog approaching, I thought it would be a good time to revisit lay flat books and compile an overview of what options are currently out there. Several more photo book companies have added lay flat products to their line ups since I first started this blog. I frequently get questions emailed to me and posted on my Facebook fan page from newlyweds who want to make their own wedding albums so I hope this will help everyone navigate all the exciting choices out there. First of all if we’re talking about lay flat books, I should show you what a standard photo book looks like. Below, you can see the book’s pages do not lie flat and some of the image isn’t quite visible in the middle because of the way its bound. It’s like your garden variety book you may find on your bookshelf. This particular one is a Deluxe size photo book from MyPublisher. (UPDATE: MyPublisher closed as of May 2017). Below is also a MyPublisher book but with the lay flat upgrade which typically adds $15 to $45 to the cost depending on the size of your book. 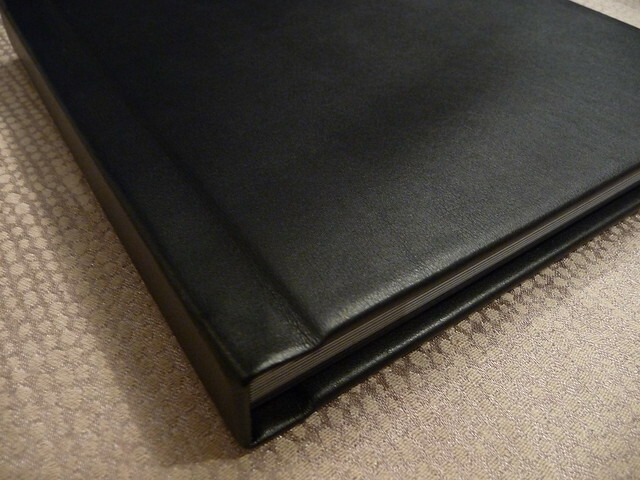 Here’s a close-up side view of the MyPublisher lay flat book which shows how the binding flexes. There’s a thin laminated hinge that is visible, but blends into the background. This is what I’ve been calling “flex hinge” in the chart below. There is a small gutter with this book. 2) For others a lay flat book is a completely different product altogether, different binding and different paper. (Mixbook, MyPhotoCreations, Picaboo, BrideBox, ArtsCow, Shutterfly, Snapfish.) (AdoramaPix only makes lay flat books.) The upgraded paper may be real photo paper or may be digital press paper – usually the printed page will be fused to another surface giving the page a weightier feel. You can see from the photo below that there is a white inner core to the pages. This is a photo of the Lake from BrideBox. If you want a detailed comparison of standard paper vs. photo paper, and information about the differences in how they are printed, check out this two-part series on paper options. I frequently field questions from brides asking, “Where can I get a professional photo album with super thick rigid pages that lay flat?“ This dear friends is what you’re looking for – a flush mount photo album. My flush mount wedding album (Anza) from BrideBox / MyPhotoCreations. A flush mount album is typically the most expensive album you can get. It’s the high-end luxe version of a photo book and used to only be offered to pro photographers, but are now readily available to consumers. Most companies targeted to pros do not sell to consumers, but there are some that do. The ones that do however may not offer software which is as user friendly as the interfaces offered by the more commonly known companies, so they may not be the best option for beginners. My site focuses on companies that market to the average person. As mentioned, flush mounts are a special type of lay flat photo book. Note, “All flush mount albums are lay flat books, but not all lay flat books are flush mounts.” I have sometimes seen comments or reviews from readers disappointed when they’ve ordered a lay flat book, thinking that lay flat instantly translates to thicker pages (like a flush mount), so be sure to make note of the specs in my handy dandy lay flat photo book comparison chart below. In a flush mount, the image is printed on real photo paper and then fused onto a hard, stiff heavyweight board. If you look closely you can see the core in between the two pages of photo paper. The pages are very thick and you cannot crease the page unless you were intending to and at that point, you would be purposely trying to harm it. These types of books will give you the thickest pages you can typically get. The thicker pages make the book feel more upscale, and correspondingly they are more expensive. Because of the higher price, you’ll usually see these albums used for special occasions like weddings, anniversaries and milestone birthdays. The super thick pages typically mean you can’t have a ton of pages in your album. Usually flush mounts max out at around 20 to 30 pages (meaning sides). I have seen some go up to 70 or 80 pages however. Flush mounts are printed on real photographic paper which results in a clearer image – you don’t see the individual dots that make up an image like those you’ll see in a digitally press printed book. Again, be sure to check out my post about photo paper versus standard paper for more details. Flush mounts are offered with leather covers and full photo covers, as well as acrylic, glass, and metal covers too and in some cases you can have a title embossed. You’ll typically get a nice matching presentation box with these types of books. Flush mount or not, every book has a gutter. The gutter is the very center of the spread where the book folds. Some photo books will have a separation in the middle (an actual split) while others will just have a crease. The ones that just have a crease are printed on a single sheet of paper that is folded in the middle. If you love to make two-page spreads where a single image or layout encompasses both pages of a spread – like my wedding layout shown above – then you naturally want the smallest gap possible. Even where there is a gap, it’s pretty small as you can see above. The most important thing is not to place anything too crucial like someone’s face in the gutter! What’s nice about a lay flat book is that it lends itself to designing across the spread, and by that I mean not only the ability to have a single photo take up both sides of a page, which is a common feature now, but also allowing for stickers and other clip art, borders etc. to be used across the middle of the page. Nearly all of the companies allow you to do this. (At left is my AdoramaPix book). Of the ones listed below, Shutterfly is the only one that doesn’t easily allow for that, but there are workarounds and you could always design your own pages in an outside program. You’ll find more specifics on each company in my reviews in the chart below. I chose an 8 x 8 square hardcover book for comparison purposes. If the company doesn’t make that size, I picked the next closest size and noted that in the chart. One of the most controversial topics that come up in photo book circles (okay I’m exaggerating here, but I have to make this sound exciting) is the logo. For the professional photographer, a logo is a no-no. You don’t want to spend hours and hours designing a book for a client only to have the printer slap their brand on it. Some of the books below do not come with any company branding while others allow you to remove their logo for an additional fee. For some companies the logo cannot be removed. On some books you may also find a small barcode which some may find unsightly. I have heard some folks have cut out the logo page with a sharp razor – which may or may not work in all cases depending on where the branding appears. Not all companies make this info easy to find by the way, so I had to chat a lot of them up this morning! Chart is a representative list of lay flat photo books, not all styles or options are noted above. Shutterfly prices researched as of 8/20/2017 – others to be updated soon. *For those companies that allow you to pay to remove a logo, I am not 100% sure whether the barcode can also be removed as well. Hope this helps you navigate through the options. There are many choices and as you’ll see from my reviews, I like many of them for various reasons. For me, I think about what kind of book project I’m doing and then I pick the appropriate product from the appropriate company. Because there are a number of affordable lay flat books to choose from, I make lay flats for more than just special occasions. I do a lot of my vacation books as lay flats as that type of book is suited for beautiful landscapes and panoramic shots. Additionally in particular I like to make “board books” for my toddler as the stiffer pages are more baby-proof and often drool proof (be sure to watch for sharp corners though). 2) None of the flush mounts I have listed above are on promotion now, but I have gotten special coupon codes for our readers from time to time. Be sure to check out my deals page for the latest deals on photo books and other photo gifts. If you’ve narrowed it down to a couple options, be sure to click on my links for a more detailed review of that product. If I’ve tried it before it’s linked, if you don’t see it here, I haven’t tried it yet. Regardless, I’d love to hear about any of your experiences with these books or with other companies you’ve tried. Thanks for the review. I have never ordered a lay flat book from any other company than MyPublisher. I absolutely love the lay flat from their company for my everyday books. Actually, I love it so much, that when I order a copy for family or friends, I always (at an extra cost) order them in the lay flat style. The books are so much easier to flip though and I like that the pages are thinner. I got a little too confident when I made my last book and I put some text in the gutter. There is a slight trim from each page that ended up cutting off one letter out of each word that feel directly in the center. But, even with that, I love the lay flat option at MyPublisher! Hi Mike! I’m a big fan of the lay flat MyPublisher books myself. Who do you use when you’re doing more than an everyday book? Help! I’m doing a photo book for my dad for his 80th birthday. I have a LOT of photos! I would definitely like the very best quality as this will be a book about his life that will be cherished by all of us for many years to come. I’m looking at lay-flat pages for sure and would like the best photo quality and paper thickness as possible. Which company would you use for a project like this? I would look into a flush mount versus a regular lay flat. But if you need more pages than is typically offered in a flush mount, then look into AdoramaPix’s standard lay flat books or Shutterfly with a lay flat upgrade. A little disappointed that no where on your site do you ever mention that mixbook does not have the lay flat option for all of their book sizes, in particular their biggest book at 11×14. What a great post (and you were worried?!)! I wish this post were out when I was researching lay flat albums. I debated between Mixbook, Shutterfly, Bride Box and My Photo Creations. I ended up using Shutterfly because of their most recent special and I’m already familiar with their site. BUT I will make a flush mount album with My Photo Creations or BrideBox one day… If ever a special comes around or another special occasion! Thanks for this post! I reference your site a lot and was just hashing through the pros and cons of my next layflat book. I have 2 that I just finished from Picaboo and Mixbook and I don’t think I’ll ever go back to the regular kind! I’d love to know what your go-to books/companies are for certain occasions like a fancy vacation vs a family birthday party vs a wedding… I know that is probably a really hard question! I have been a big fan of Picaboo layflat books having made at least 6+ of 90 pages. I’m starting another using their online-only software. I know I should ramp up into using Photoshop Elements but I don’t want to take the time to learn. These big books are such a project and I’m always behind schedule to get them done. Sigh! PBG, this is an amazing research blog. Wow! I have ordered quite a few books this year and they are all lay-flat books. Worth every penny! My favorite is AdoramaPix, except for their page limits. Even since they’ve changed their limits recently, I still find myself needing more pages than they allow. I’ve been ordering from Shutterfly and I am very happy with their lay-flat books, especially since they now offer a 10×10 size. I will never order from Arts Cow. I did once, since I had a coupon for a free 8×8 book. It was horrible! Besides the fact that it took over a month to receive it, the quality was the worst I have ever seen. Plus, who numbers pages in a photo book??? Not me!! Every page had the edges cut off – more than the 1/2 on all sides was gone! That is unacceptable to me. It says on your chart that MyPublisher offer an option to remove their logo for $10. Can you explain to me how? Or at least direct me to the instructions on how to do it? Thank you! Have you tried Blurb? What is the highest quality you have found? I assume that option would include photo paper. I’m trying to decide between MyPublisheer, AdoramaPix, and Blurb. I make books frequently with all three. If you look at my main reviews page you’ll see reviews for all of them. Blurb and MyPublisher do not print on photo paper, only AdoramaPix does. It depends on the look you’re going for – perhaps the reviews will help you figure out which is best for your project. Best! Any opinions on the following? I’ve wanted to use this company for my wedding album but I guess it’s still relatively new.. Sorry, I haven’t tried them yet! Photobook Girl, Any advice on wedding photobooks? Recomendations? I saw samples of yours and it was beautiful. 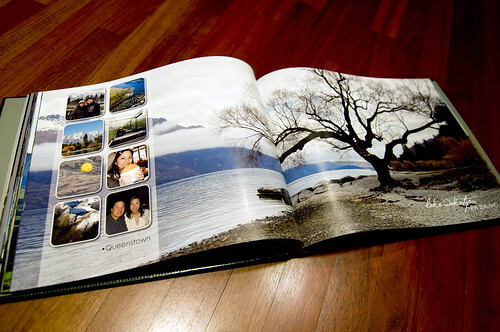 How many pages did your wedding photobook end up being (front and back=1 page)? I am not certain how many pages/photos is too many and for instance, how many pages did you devote to just your wedding dress and details or getting ready photos? I am concerned that I may be putting in too many photos for each section of the wedding, (e.g.getting ready, details, bridesmaids, groomsmen, ceremony, cocktail hour, reception, etc.) Any advice would be appreciated. Thank you! Hi Alejandra – all my wedding photo books are here with specs: http://www.photobookgirl.com/wedding/ I think you’ll find a lot of info here! I think you should pick your fave photos and not worry too much about how many pages each section ends up being. It’s all about the photos you love from your special day! Congrats on your wedding! Great post, do you know if mixbook will have layflat pages that are thinner. 2 inches thick for a 100 page book is just too much! My photobooks are generally like 200+ pages and the lay flat option is way too thick. I got a snapfish layflat book once and the pages were much thinner which suited my needs. I don’t know of any specifics for a new lay flat from Mixbook. They do have the Montage product now. I have a review on my site. But the printing is done in a similar way as the Mixbook lay flat, just a different interface. Thanks for the great comparison! I’m interested in creating a lay flat book for my son’s “First Year” album and I want to make as large a book as possible. I’m currently planning on using Adobe InDesign to create the book. Do you know if any of the companies in your table (especially the ones with the highest page number options) will print a pdf or some form of exported book pages not created in their software? I’ve spent some time trying to figure it out and it’s not always very clear so just curious if you’d have any more information. Blurb is a standard choice from InDesign but they don’t have a lay flat option, unfortunately. Thanks!! I believe you can save the design in InDesign as a jpeg right? If so, then any company can accept a jpeg. I design my own pages in Fotofusion and/or Photoshop and I save my pages as jpegs and I don’t have any problem using any company. Sorry for the last response – I missed your comment until now. No sorry I haven’t – there’s so many companies out there and I don’t have too many big occasions to do flush mounts (nor the budget)! I will have another flush mount review coming up though. You can check out AdoramaPix and their Hudson book. We’ll be having a giveaway shortly too! This is awesome! Thanks for doing it. I am trying to decide between doing a layflat-pages book through AdoramaPix (not the fancy flush mount) or mixbook. I read your review for both, but I can’t really tell from those if one is really better than the other. If you had to choose to make a book with one of those companies, which would you choose? Thanks. I like both products but for different reasons and it’s hard to compare because they are pretty different even though they are both lay flat. If you like real photo paper I would go with AdoramaPix. First, thank you for a very informative blog. Like Kristie I’m creating a first year book for my daughter and trying to include the maximum possible pages. The way it looks now it will be between 100-150 pages. My question is which company would you choose for this voluminous job. I was debating between Mixbook and Shutterfly, I just want to make sure that they use thickER (i.e. upgraded) paper for the layflat pages, but not so thick that it wouldn’t be able to handle the quantity. I understand there is a difference between binding styles also, and I’m not sure which one provides crease vs gutter and what’s best in my situation. Bottom line, I would like to create a LARGE layflat photobook that is sturdy enough that pages don’t fall apart. Please help and many thanks. Did you get a chance to look at the comparison chart I have in the post? It tells you what the max page count is for each of the lay flat options as well as binding specs. I also have a link to the specific review for both Shutterfly and Mixbook’s lay flat books so you can find your answers there for sure. Neither of the lay flats go to 150, so if you have a longer book I think you have two options, go with a larger size so you can fit more information on 100 pages or do a two volume book. I have more on doing book series here: http://www.photobookgirl.com/blog/multi-volume-photo-books-make-a-series/ They both use thicker paper but it depends on the look you’re going for. I think the Shutterfly one is thick but not too thick, but Mixbook’s software is more user friendly and flexible. Your evaluations are awesome! I recently bought a layflat-pages book through mypublisher & look forward to trying AdoramaPix. This is a great post. I just wanted to throw my two cents out there for others who are trying to decide which company to use– I recently made a huge photobook for pictures from our European vacation. I used Shutterfly’s lay-flat option and their new 11×14 book size. My book was 107 pages total. I was super impressed with the book! The paper was nice, thick quality and the photos printed very nicely. While the lay-flat option adds a lot to the cost, it was well worth it, especially for this type of book. I definitely recommend it. MyPublisher hasn’t printed on photographic paper until very recently, but that’s only in their new line of flush mount albums that just came out. Photo paper does give you very good print quality, but that doesn’t mean that companies that don’t print on photo paper don’t also have good quality as well. It’s more of a preference in my opinion. I think this post will be helpful. There are two parts to be sure to click on the link at the bottom to see both: http://www.photobookgirl.com/blog/how-to-choose-the-best-paper-for-your-photo-book-part-1-of-2/ I think many of your questions will be answered. b/t/w be sure to check out my giveaway for a flush mount album – see the blog! Regards! So happy I came across your site. Can you confirm that Shutterfly does in fact give you the option of removing their logo with the purchase of the Pro Gallery Plan. Does this apply to individually purchased books as well or books purchased in bulk only. In addition, does this also allow for removal of the barcode as well? Your site is great! Thanks for all the reviews. Have you ever looked at Artisan State? I’ve heard both great and terrible reviews! They have flushmount and also regular layflat albums. Thanks! Has anyone had trouble with a flush mount and the pages getting wavy or bowed? I tried artisan state and the pages did this even at the 6 x 8 size. I’m thrilled to have found this article- looking to change companies and find a book that’s flush mount that’s higher quality. Has amount used artisan? I have not used them. That’s very odd to have the pages get wavy. Flush mounts are typically very thick and I would think very hard to warp. Did it arrive that way or later warp? Have you asked customer service? They should replace that for you. Whoops! Typo above – I meant has anyone used artisan? I have two pictures but I can’t attach here. Just thought of asking, who in your opinion makes quality layflat photobook? with plenty of layouts and not so confusing software? Well, the answer to your question depends a lot on budget and what type of paper you prefer. The flush mounts offered by several companies are the nicest but more pricey. Overall, I’d suggest giving AdoramaPix, Shutterfly, MyPublisher or Mixbook a try. I print with all of those companies pretty often. It really depends on the project though and the sales! Thank you so much for such an informative article and website! I know it must be expensive to do all of this research, and am grateful that you’ve taken the time to do such a thorough review process for the popular sites. Since we’re based in NYC, I’ve had the most experience with AdoramaPix and have loved their lay flat books, but wanted to check out their competition and design tools that other companies offer, for different projects. Thanks for providing an excellent jumping-off point! Hi. I’m wondering if this is still an active blog. I asked a question of whether the pages falling out of Shutterfly albums was still an issue? I also have a question about the best shape for a wedding album. I have mostly landscape photos and would like to do at least a couple of full page spreads. Thanks for your help! Kathy, I would do a portrait album – you’ll get the best full page spreads with the least amount of loss of the photo if you do that. I haven’t personally had any pages fall out of my Shutterfly albums. Is this for the regular ones or the layflat upgrades? I havne’t had it happen for either. Any further updates to the chart? I do scrapbooking (weekly) and have about 110 pages that I need to print. Last year, I went with Shutterfly & don’t *love* it. The pages seems glued together (front/back) & I worry about how that will hold up over time. I may try Blurb this year, but they don’t offer a lay-flat option at this time. Given how many people are doing Project Life scrapbooking now & need more pages, I’m surprised more companies aren’t going to more pages. Thanks! I forgot to mention that I need it to be 12×12 since that’s the size of all my files & previous year’s book. I think I have decided on using: my photo creations, The Lake Album, for my wedding album. I don’t see any specials…. do you have any suggestions ? Signing up for the company’s emails will usually get you some discounts sent directly to your inbox. Congrats on your wedding! Hi Kate, did you see my Montage review here? The standard paper is quite different from other photo book companies so it is a personal preference. They also now offer silver halide photo paper but I haven’t tried that yet. Hope that helps! So, I really appreciate your blog and all of the information collected. Your clearly very educated in all of this. I am a bit overwhelmed by all of the information. Can you please email me privately? I am trying to deciper your opinion on what book would be best for a family yearbook. I want to make one every year. I like the lay-flat option and the leather cover. Hi Hillary, sorry I don’t do private consultations, but feel free to message me here. A lot of it depends on your price point and preferences, how many pages etc. This blog is so helpful yet I’m still at a loss for what to choose. Maybe you could help?! I’ve only used picaboo because they often offer great discounts like 60% off (I always wait for the discounts to print!). But I find printing on regular paper just doesn’t do the beautiful images justice. Any ideas for companies that print on real photo paper and also aren’t super expensive? I’m fine subscribing to their email if they offer good discounts so I can save $$$! I’m glad you’re finding my site helpful. If you’re looking for real photo paper I would check out AdoramaPix. We feature deals on their products all the time on our deals page. Definitely sign up for their emails and be sure to check our exclusive promos with them too! Hi I make portrait layflay 8.5×11 photo books for clients and have recently ran into some issues with my printing company. I would like to start using one of these online sites however I am not sure which will allow me to resale the books and not have their logo on the end product. Also, do any of these generate a proof that can be emailed before printing? Which would you say for layflat books is the easiest system to use and allows you to add or change layouts on? Thanks so much! Portrait oriented books aren’t as common among photo book companies. I know that AdoramaPix makes them. If you’re a pro they also have a professional division which should mean you would get some professional discount I believe. There are no logos on AP books. Their software is pretty easy to use and is full featured as well. Yes, you can complete your page layouts in external software and then upload them as finished jpegs if that’s what you mean. After uploading, just select a full page layout with a single box and then drag the completed page into you the box. I found your blog very helpful with detailed information about many photo book companies. This site helped me select Adoramapix for my wedding album. I received it today and it is absolutely stunning! The quality is excellent. I ordered the Hudson Album with extra thick pages in the metallic finish. The metallic finish has a very nice shine but not too shiny finish. The photo book looks professional and better than my friend’s who paid thousands for a professional photographer and photo book. I’m excited to get started on my next photo book and will be using this site as my guide! Goody bye old fashion scrapbooking. I’m so grateful for all the work you have done and sharing your work for others to use. Hi Julie, Sorry for the late reply – so glad you love your book! The metallic paper is really nice. I used it for the personalized table numbers at my wedding and they really added that extra glamour I think. Congrats on your marriage! Since you don’t list it, I will mention how pretty, different and interesting Nowell Books are. I think it should be accessible on other platforms besides iOS. It is a 8″high by 4″ wide flat fall book when it opens it opens best as a square image 8×8″. The pages are very stiff like board books and 20 pages =$20. They have a way of getting discount coins by recommending, etc but you only have a week to use them and they expire (before once you got them that was yours always, my only complaint). But they are so beautiful that complaint goes. Just curious, have you reviewed any of the flush mount books used by the wedding pros? I’ve seen and sampled plenty of books, but I’ve always gone back to the same company as their books are TANKS with a guarantee against warping. I look forward to your reviews! Best of luck! No I haven’t except for the pro companies that will also sell direct to consumers. A lot more companies are selling direct to consumers now. I find that some of the pro centered ones have software that have to be downloaded and may not be as user friendly. Since my site is more focused to the general public that’s what I focus on. Curious – what pro company do you prefer? This guide is wonderful! I just got married and we have decided to invest in a really good flush mount album. This post was SO helpful, so thank you so much for taking the time to write it. I was about to go with adoramapix, but I ran a google search and found a ton of horror stories (some recent) of albums arriving in poor condition and their customer service department often refusing to correct the issues. This makes me hesitant to use them. I had two questions: 1) have you heard of people having these kind of issues? 2) is the quality of adoramapix’s flush mount album much better than bridebox/myphotocreations? If the flush mounts from adoramapix and bridebox have the same print quality, I’d rather go with bridebox. Thanks for any advice! I haven’t personally had issues with either company. Any time I have had issues with any company I have asked for a reprint and gotten it. Unless I’m doing a review no one knows it’s photobookgirl, so I don’t think my experience is different from the average consumer. I’ve posted my reviews of both on my site. Check those out if you haven’t yet. I am making a book for my mother-in-law. Many if the photos are very old and any size I use in the book brings up the caution sign to say the photos won’t be sharp. I will use these anyway as they are all I have of that Era. But I wondered about others’ experience using vintage pic? Possibly check the dpi and size of the scan? If you have the old photos perhaps scan at 300dpi and see how those look. You can also choose a smaller photo box so it doesn’t get too enlarged. I have also used photo editing software to sharpen and increase contrast of old pics to get faces and other details to show more clearly. That all said, the charm of vintage photos is that they are a bit fuzzy. I would try some photo editing though. Lots of free software to do that online. Best! Hi! I’ve read so many of your reviews and they’ve been so helpful. I am limited, though, to non internet programs. I had been using a program in europe called hoffman, which had thick glossy pages and hard, almost plush image wrap covers. I loved them and was looking for something similar in the U.S that would offer that with an offline option. I’m trying not to spend the ‘flush mount’ prices. I’d appreciate your advice. Thanks. Hi, I’m not sure I can think of an equivalent to your Hoffman program. I looked up their site. I don’t see too many plush image wrap covers with thick glossy pages offered by U.S. companies catering to the general consumer – perhaps one of the pro centered companies might have such a project. To remedy the offline book making issue, you may want to consider buying your own photo book layout software. It offers you the most flexibility in printing your book anywhere and is not that expensive if you like to make photo books on more than just an occasional basis. I use Fotofusion myself. You can look up reviews of that on my blog. Looks like you are an expert on this subject! I recently officiated a wedding ceremony and the couple has asked for a copy of my remarks. I want to do it as a bound book for them but in this case it will be mostly text with just a few photos rather than a photo book. And it will only be a few pages – certainly not more than 8 or 10 once I add a few photos. Can you recommend who I should use for this? Shutterfly’s books are, of course, highly photo-oriented. I also found something called Blurb but am not familiar with it. Any thoughts? Hi there! Any of the companies can accommodate text. There are layouts with all text and mostly text in just about every company, so I don’t think you should limit yourself. Both Shutterfly and Blurb are well known and would both produce good results. What you’re mentioning reminds me of a baby lullaby book I made for my older son. If you click on the link you’ll see that there is text running in the middle of the photo backdrops I’ve chosen. http://www.photobookgirl.com/blog/new-photo-book-coupon-codes-and-deals-baby-lullaby-photo-book/ Similar in a sense. I chose the images that reminded me of the words of the lullaby, calming, serene… Maybe you can find some inspiration there. Any of the companies will work for you though. I may suggest that you go for a lay flat book – for your particular project I think AdoramaPix would be a good choice. Hi – so glad to find your blog! I want to make my own wedding album and with professionally printed photos that are mounted or slipped into nice mats. Are there any companies that sell albums with mats that don’t look like they are from the 70’s? Or companies that will make one for you online? All I see are flush mount options and I really want traditional photos and mounts. Sorry Annemarie – I don’t know much about slip in albums as I’ve gone digital for the vast majority of crafts that i do. I would try your local craft store like Michaels or Joann’s. Also try a site selling to pro photographers. They may still have a selection that might work for you. I get what you mean about the 70s thing though! Hi, are you familiar with Milkbooks? I am trying to use their site because they offer archival quality materials but I’m finding it difficult to work with – limited in terms of layouts and number of pages per album. I’m wondering if you have used the site and have any tips or would recommend to steer clear of them? Have you ever made a flush mount album with photobook America? I was wondering if the print quality was better than their lay flat album which was not vibrant. Also I was wondering if the wrap around cover is the same type as the lay flat. Thank you. Have you tried the Walgreens premium lay flat books? How do they compare? Which has the best photos? Hi Rodna, I haven’t tried them. I typically do not recommend any photo books that are printed in-store. I’ve found that machine maintenance from store to store can vary greatly and the level of quality I expect is not usually found at a local drugstore as that is not their main business. If the books are made off-site, sometimes you can tell when you open up the software program where the books are actually printed. Brick and mortar stores actually team up with larger printers and have their books printed there (sometimes names you may recognize like Snapfish or Shutterfly). If you do decide to order, hopefully you can see a sample in the store so you have an idea what the end product looks like. Hope that helps! Did you happen to try the Walgreen’s premium layflat? I am looking into that now and hoping the final product comes out as good as it looks online. Hi there!! love all this info but I am completely overwhelmed!! Was wondering if you could suggest a good online photo book choice for me. I am creating a “parent photo book” for myself from my son’s wedding. The pricing and options through their photographer is just too crazy, so I want to create one myself. I would like the lay-flat, beautiful color/texture and easy to maneuver (all the pics on in my dropbox) and the option to have as many pics as possible. There are so many choices of companies but I would really like something that looks and feels more professional. Any helpful suggestions? I looked into Milk, Artifact Uprising, AdoraPix (got confused with paper quality….silk finish?) and Mixbook. Would so appreciate your thoughts and suggestions to help make my this project a little easier. Thanks so much!! I think you might like the AdoramaPix books. They are printed on real photo paper and the software is easy to use. If you go with the standard books (that are lay flat by default), you can get more pages and more photos. The Hudson albums are nice as well, but they will cost more – so whatever is in your budget. I typically go with a luster paper. It’s the standard one that will look most like the basic photo finish you’re probably familiar with. Look at my review (linked on the chart) and you’ll find my wedding book there… Best! Hi, Have you looked into Artifact Uprising at all? I was going to go with AdoramaPix but love how you can write something on the spine of the AU books (like Vol. 01, Vol. 02, etc) and wondered if you had any input! Thanks! Great blog, great comments! But I don’t see my particular problem addressed. I have a Shutterfly lay-flat book, and one of the pages is separating at the binding. More exactly, it looks like the photo paper is separating from the cardstock, or the other piece of photo paper it is glued to, and this is happening at the binding. It looks like the other pages are pulling this page apart when the book is open and laying flat. I could easily put some glue in there and press it together, but is that the solution? It looks like the pages should have a binding strip/spine behind them to hold them together instead of relying on the strength of the glue holding the photo paper and cardstock together. If anyone else has had this problem, please share your experience. Thanks! I haven’t had that happen to me – you should definitely contact them and see if you can get a reprint. I don’t know if you’ve had the book for a while? But regardless it’s worth a shot. I miss My Publisher! Is there any company thst matches them for large size format, super glossy paper and lay flat? There are companies doing larger size format and lay flat, but not with the super gloss. That was a pretty specialized paper that I believe only MP was doing. Shutterfly does have glossy, but not with the lay flat and I’m not sure how glossy it is. I have a review of how Shutterfly compares to MyPublisher here. Have you checked out Zno.com? I really like their interface and have plenty of high end options including larger sizes. I’m curious how they compare to the sites you have listed. No I haven’t gotten the chance yet but look forward to checking them out! I miss My Publisher too! Have you found a company with similar features and quality? I’m doing research now on it to do my 2017 year in review photo book as the past 5 years have all been with My Publisher…layflat, super glossy pages, and 100 pages. I’m in the same boat. I absolutely loved their super high gloss pages with the lay flat option. I used it for my annual books but especially for landscape photography books. No other company that I have found has that super high gloss paper so as of yet I haven’t started my 2017 book. Exactly like you, for the last five years I had used MyPublisher for my annual photo books. Please someone, fill that market. Try Artifact Uprising or Milk Books if you don’t want to worry about quality issues as much. Bridebox albums are subpar to these type of books. I am talking about the flush-mount and layflat albums in comparison to the Bridebox Mariana and Anza. Also Zno and Miller have excellent layflat flush mount options.